About - VanZyverden Inc. Filling and Packaging Machinery Sales, Engineering, Sales, Installation and Service. Van Zyverden provided excellent support in the installation of our 18-18-6 Leibinger rotary bottle filler. They arrived at our brewery promptly and were efficient in completing the commissioning in a timely manner. They continued to provide advice and support to optimize the operations, which allowed us to meet the output goals and DO levels represented by the manufacturer. They provided the personal service and quality of work that you look for in a family-owned business that takes pride in what they do. -Stephen R. Holle, Dipl. Brw. Bottcher Brewery Consultant is an independent Brewery Consulting Agency specializing in the Craft Beer industry in the United States. One of our services we offer is selection of equipment for start-up breweries and breweries looking to expand their production. With over 30 years of professional experience, Certified Master Brewer and Instructor at Eastfield Community College (Brewer Certification Program), my first choice for equipment is Climax Packaging Machinery and Leibinger Fillers. Over the years, I have found that it is important to have quality filling and case packing machinery in order to run an efficient operation. By making these quality equipment selections my customers can focus more on what they like to do. And that is brewing high quality beer. The Leibinger fillers have low DO levels and the Climax cartoners and case packers reduce breakage and are reliable and easy to use. Another great partner to have is VanZyverden Inc.. The team at VanZyverden is the North American distributor of Leibinger fillers and they offer turn-key projects that include Climax machinery. Make the right decision the first time and you will not regret it later! “We love the filler and are really pleased so far, thank you!” Matthew Osterman, President – Sleeping Giant Brewing Co.
“We have had several visitors through here, some involved in brewing and some not – but all are equally impressed with the new Leibinger bottling machine !!! We ourselves are highly pleased with pre-delivery, delivery, installation and after-sales service. We welcome anyone at our brewery for a physical inspection and personal recommendation.” Alan Melville, Managing Director – Red Rock Brewing Co.
Van Zyverden, Inc. was started in 1990 by Clinton van Zyverden. Clinton had been working for a number of companies in the processing industry as a plant engineer and applications engineer. In 1990 he created Van Zyverden, Inc to fill a niche in those industries to provide servicing, repairing and installing chemical processing equipment. As the number of chemical companies in the northeast declined the installation, service and repair of packaging equipment became the primary business. 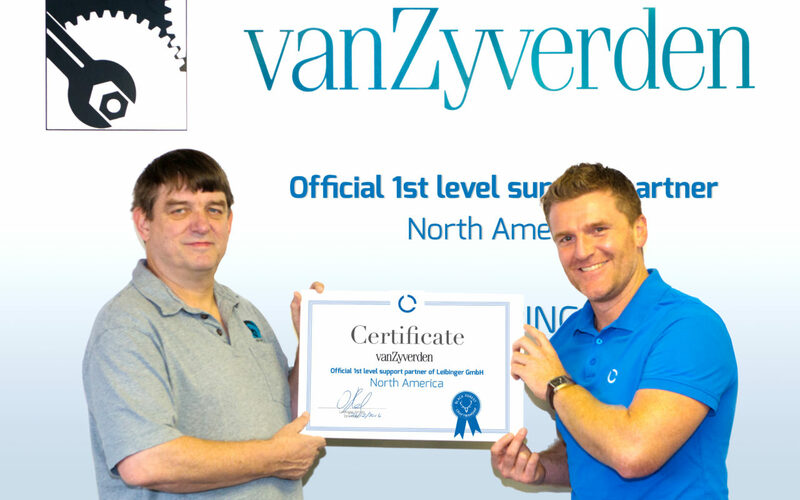 Van Zyverden still works in the chemical processing industry and maintains contact with that customer base. Van Zyverden, Inc. is located in Huntingdon Valley, Pennsylvania, a suburb of Philadelphia. We are housed in a 7,300 square feet of office and shop space. The shop is conveniently located near major interstate highways, reaching customer sites is quick and easy. The building is equipped with a ground level bay door and a loading dock for off loading trailers and trucks. The shop is equipped with a wide array of tools and machinery for fabricating and repairs: welders, plasma cutters, oxy-acetylene torch, Bridgeport, drill press, 50 ton hydraulic press, and more. We stock a wide range of parts and materials so we can react quickly to a customers request. Van Zyverden has a broad base of vendors , suppliers and sub-contractors to call upon to help solve a customer’s problem. Van Zyverden, Inc. is a full service mechanical contractor that offers the customer a wide range of services to help solve their problems. We have AutoCAD to assist in engineering the solutions for the customer. We have customers all over the United States, but our primary market is the Northeast, from Virginia to Maine and Ohio to New Jersey. Over the years we have established good relationships with many manufacturers and sales representatives, we can bring a wide range of solutions to the customers table.